For sale is one Happy Birthday Card featuring "Kreepy Kids Ted with his fear, the Easter Bunny" from Kreepy Kids' Bogus Adventure Series. 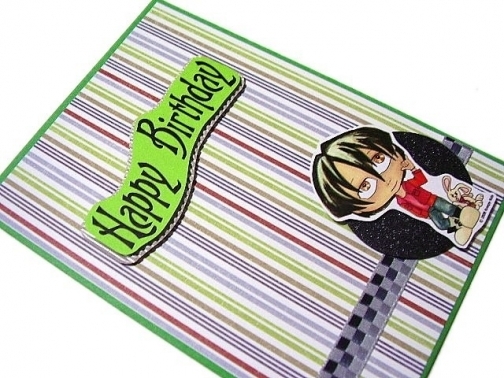 This card is designed and made in collaboration with Kreepy Kids artists who have come out with a wide collection of Kreepy Kids. The Kreepy Kids' Bogus Adventure consists of Ted with his princess and Ted with his fear, the Easter Bunny, and Bill with his princess and Bill with his fear, Granny S. Preston, Esquire. This card is blank inside, comes with a matching colour envelope, measures 6" by 4", and comes wrapped in a cellophane bag. $1.50 USD ($0.50 USD when combined with another item) by SingPOST. Your handcrafted cards are wonderful! A perfect transaction in every way! Thank you so much!